To pickle the lemons, place 125g water into a pan and add the Chardonnay vinegar and the sugar. Gently heat and stir until the sugar has dissolved. Remove from the heat and set aside to cool. Thinly slice the lemons 1mm using a mandolin. Add the sliced lemons to the cooled pickling juice and leave for a minimum of 24 hours before using. This yields more pickled lemons than is needed for this recipe, but it stores well, covered in the fridge. For the vanilla mayonnaise, whisk the egg yolks, egg white, vinegar, mustard and vanilla seeds together in a bowl. Slowly add the grapeseed oil, whisking continuously until the mixture has emulsified. Season with salt. Place the finely diced cucumber into the pickling liquid and leave in the fridge for a few hours. To finish the dish, prep the lobster by plunging a pointed sharp knife through the head. Remove the claws and the tail. Place the claws and tail into boiling water for 5 minutes, removing the tail after 2 minutes. Plunge immediately into a bowl of iced water. Crack the claw shells and remove all bone including the cartilage inside the claw. Cut your tail with a sharp knife down the middle lengthways. The lobster will only be partially cooked on the outside, so finish cooking on a hot BBQ. The claws will take approximately 5 minutes and the tail approximately 8-10 minutes. Cook on all sides, then remove from the grill and season with some lemon juice and salt. Chop the lobster into smaller chunks and place in a bowl. Add the vanilla mayonnaise to the bowl. Chop the chives and add to the bowl along with the diced celery, chopped pickled lemon and chopped pickled cucumber. Adjust the seasoning of the mixture. In the meantime, heat grapeseed oil to 160°C in a small pan and fry the onions until crispy. Remove with a slotted spoon and set aside on a tray lined with kitchen paper to drain excess oil. In the meantime, toast the brioche buns. 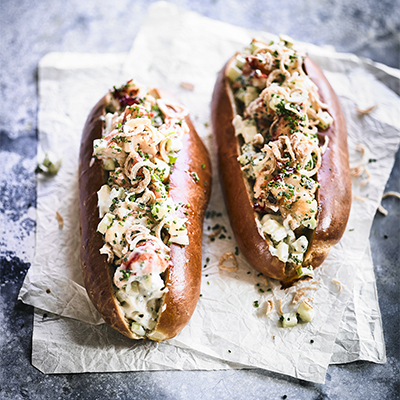 Spoon the lobster mixture into the toasted hot dog buns and garnish with some crispy fried onions.